Combining solid fundamentals with state information, this text is designed around Pennsylvania’s 60-hour requirement. This edition has been completely refreshed to better reflect today’s market needs. 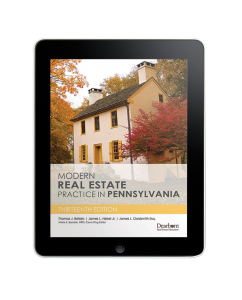 It contains everything a real estate prelicensing student in Pennsylvania needs to confidently sit for the national and state licensing exams. The national and state-specific review exam reflects PSI style, and the Instructor Resources contain three extra final exams. Even after licensure, this text is an excellent resource for brushing up on the finer points of real estate.